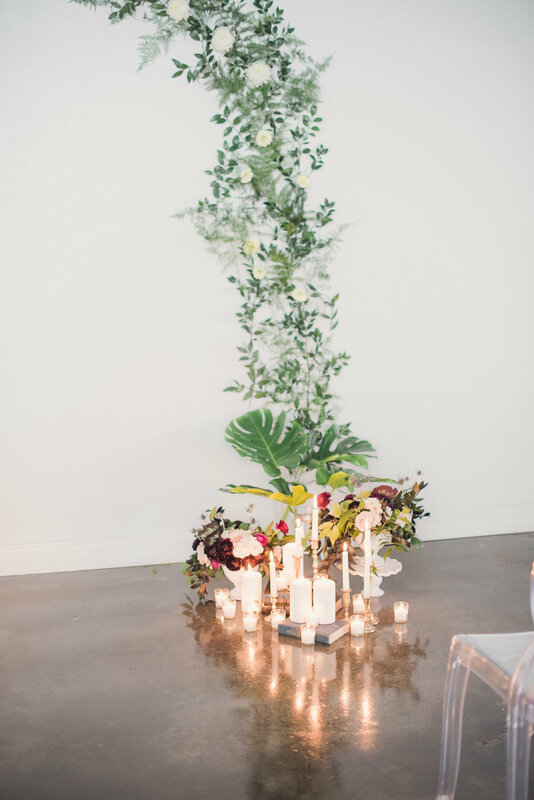 This venue was a blank canvas for us to begin with. 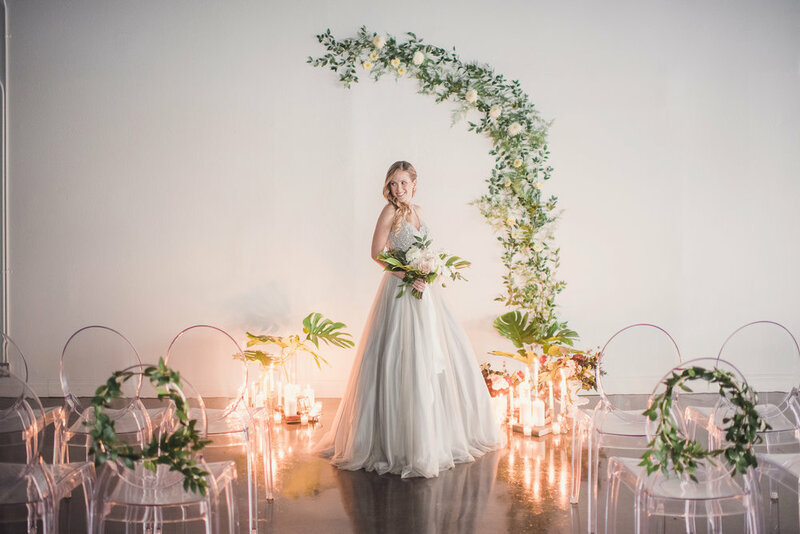 Because of its industrial feel, we wanted to create a timeless wedding that was still very intimate, yet unique in its own way. 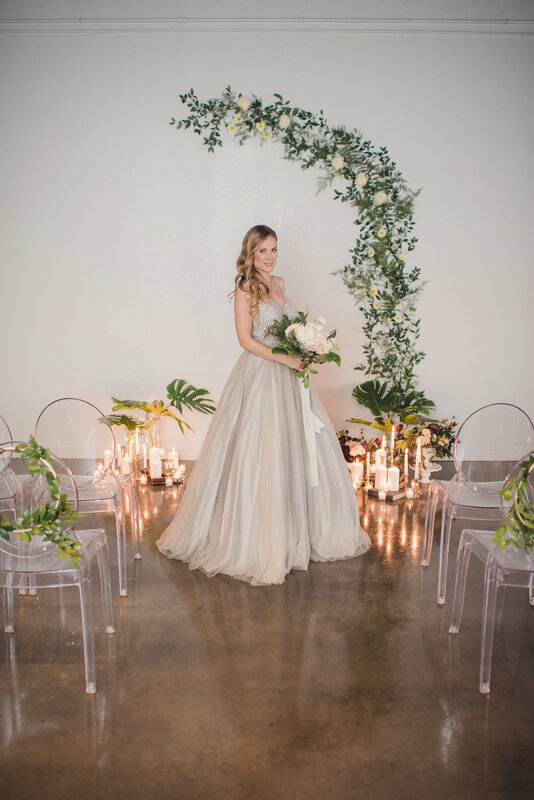 Our venue is located in the office and warehouse area in the city of Carson, CA. 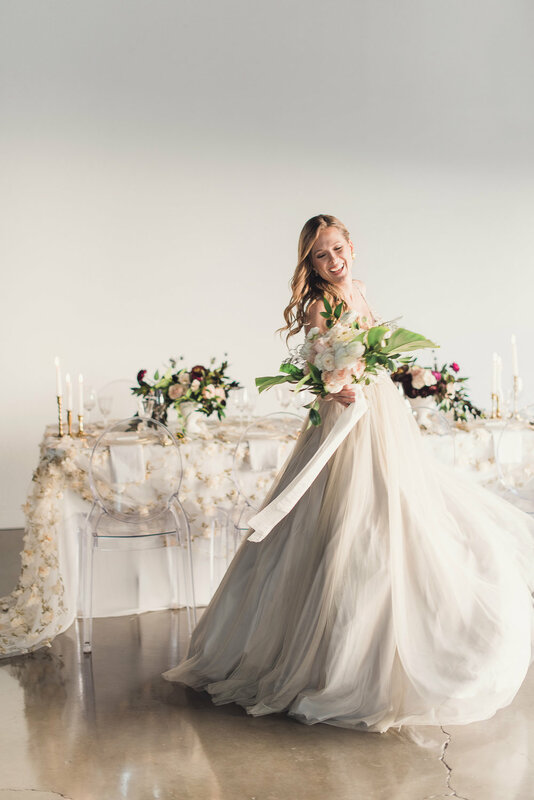 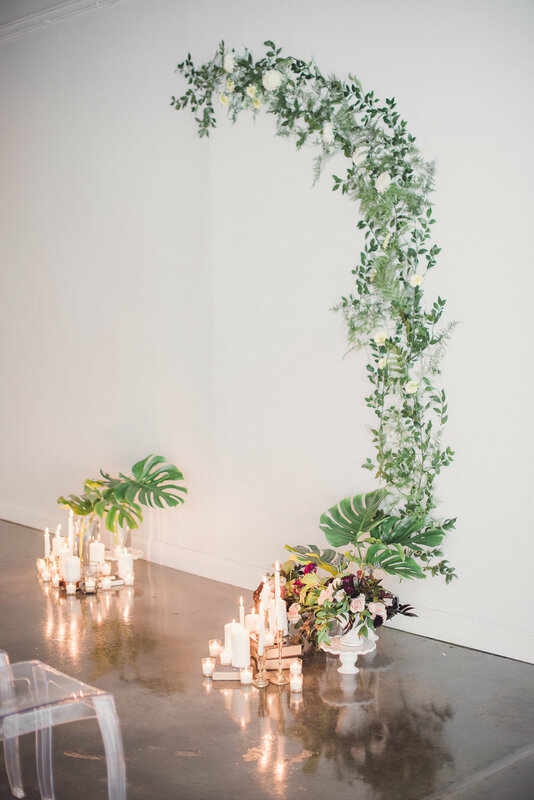 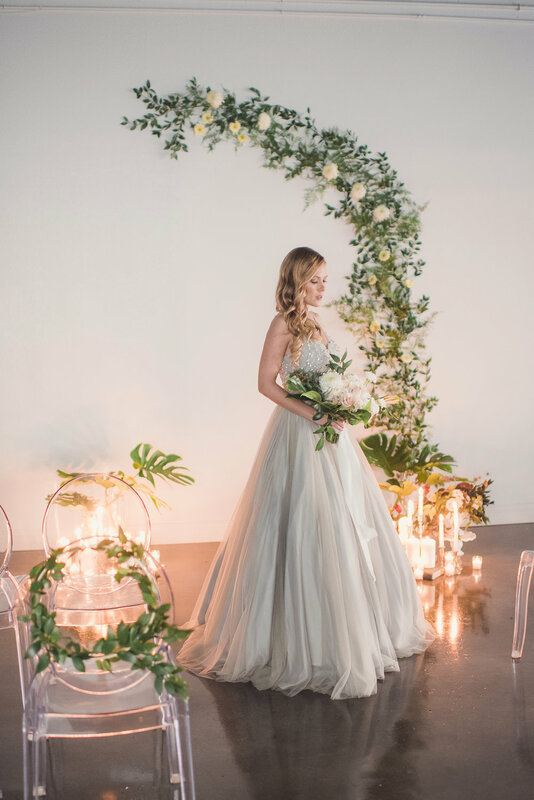 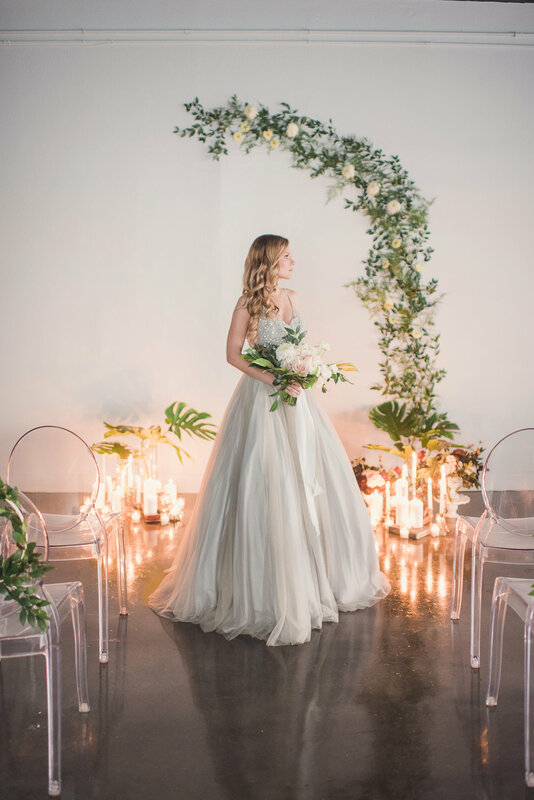 Being transformed into an event venue, the site simply consists of concrete floors and white walls which became the perfect location to do a mock wedding shoot. 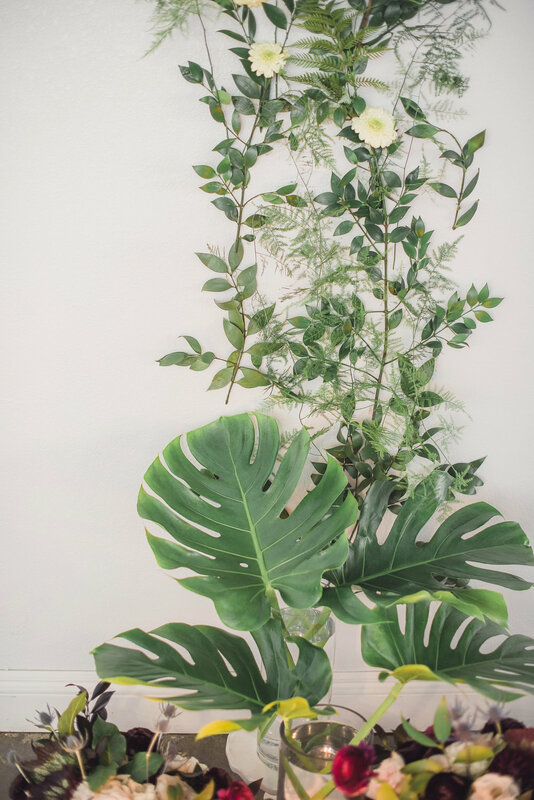 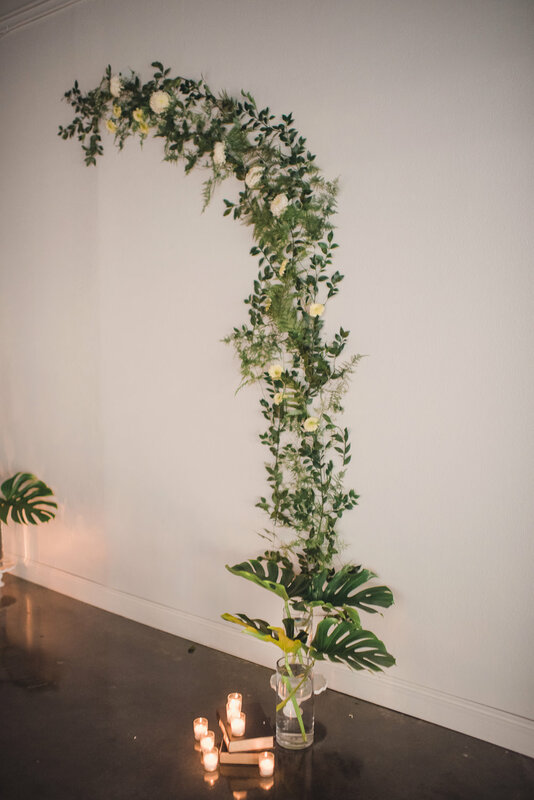 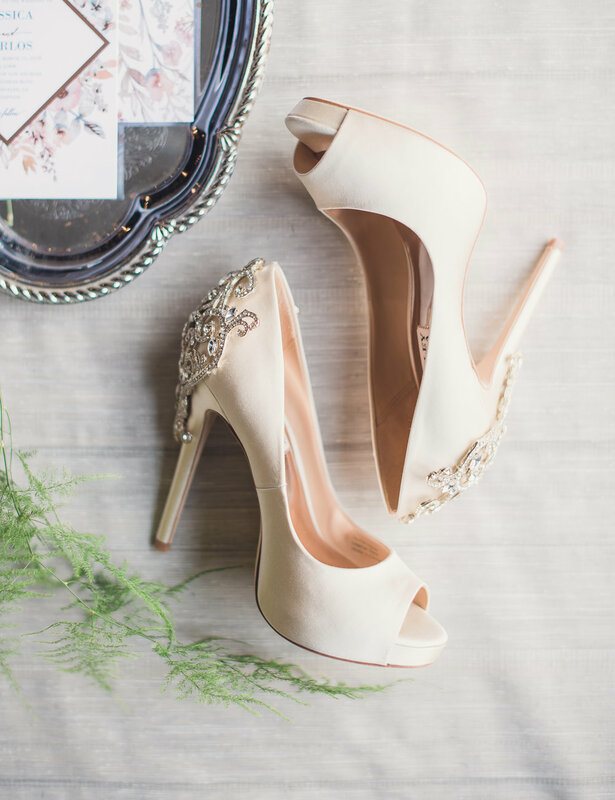 With the venue having just white walls, we added natural elements to make it livelier. 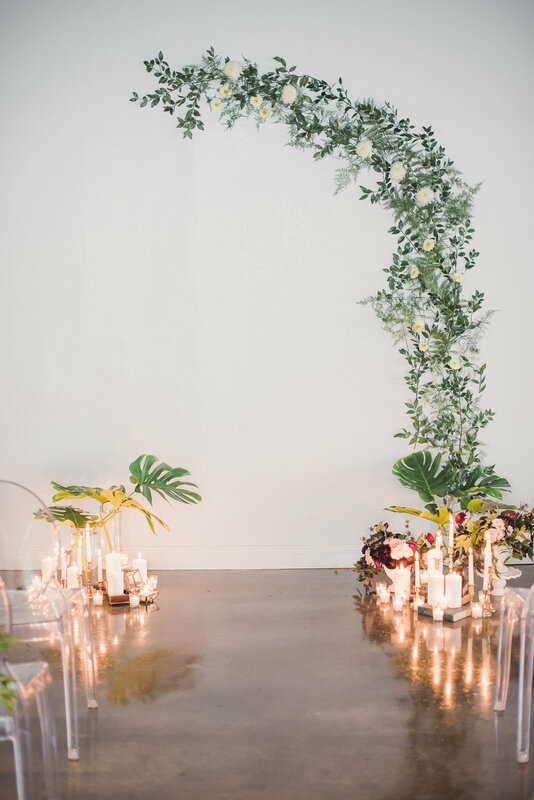 Vines climbed the walls creating a stunning ceremony arch, green wreaths were used for our dessert bar backdrop, and beautifully arranged centerpieces brought a pop of color for our dinner table. 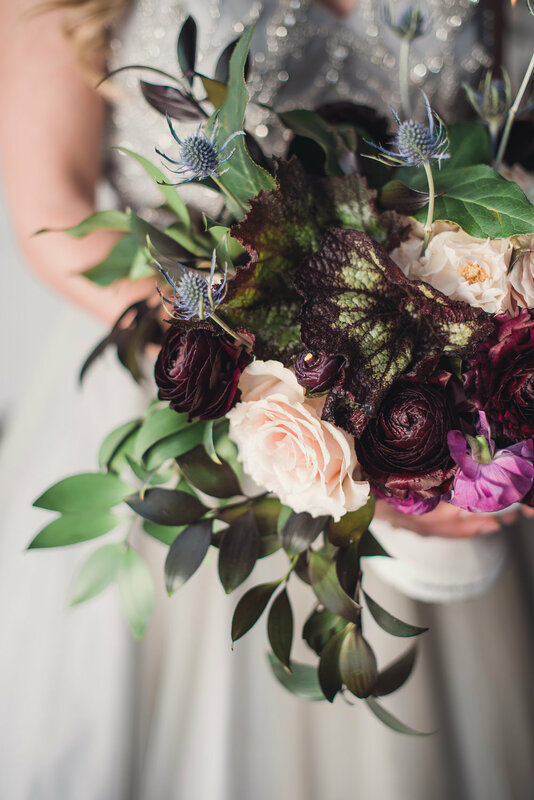 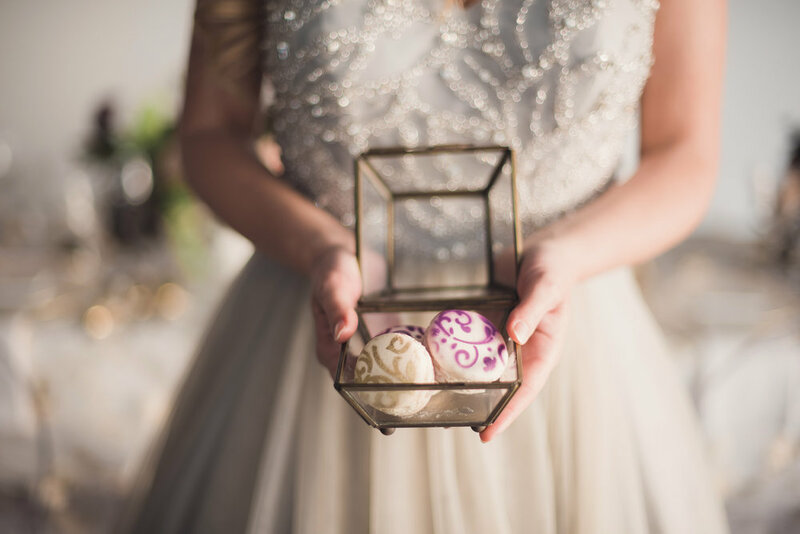 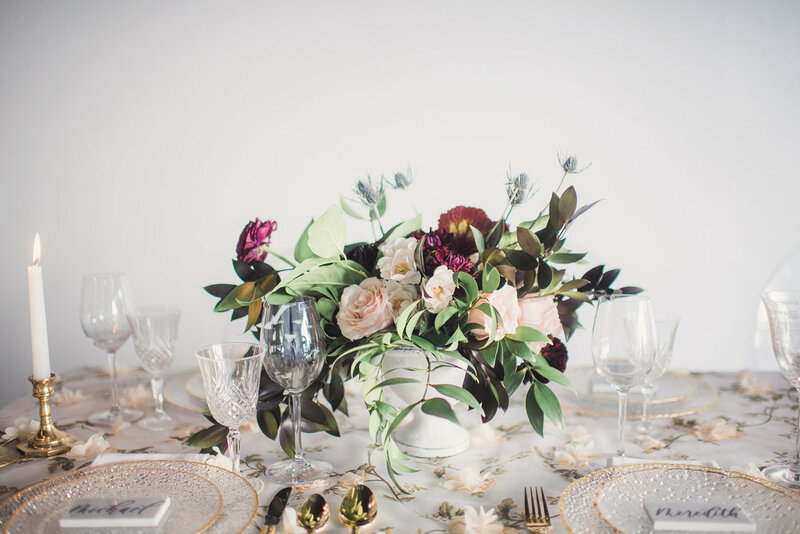 The colors for our wedding shoot were greens, whites, gold, and a pop of purple. 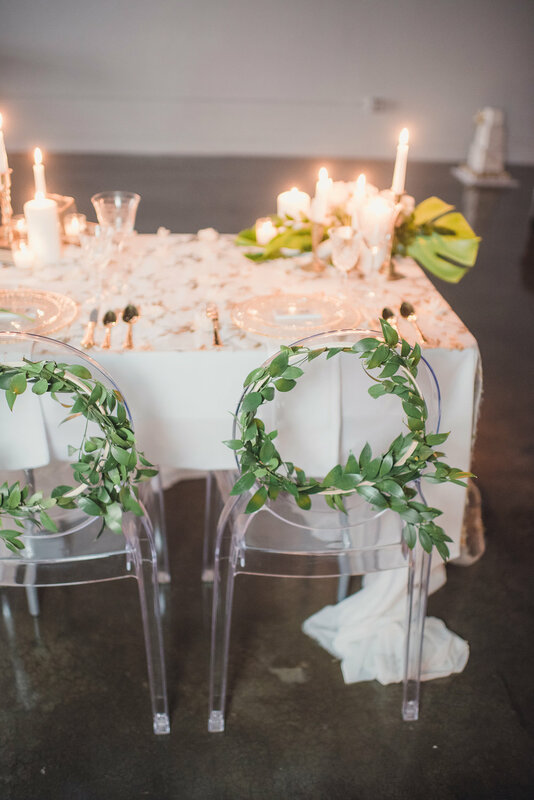 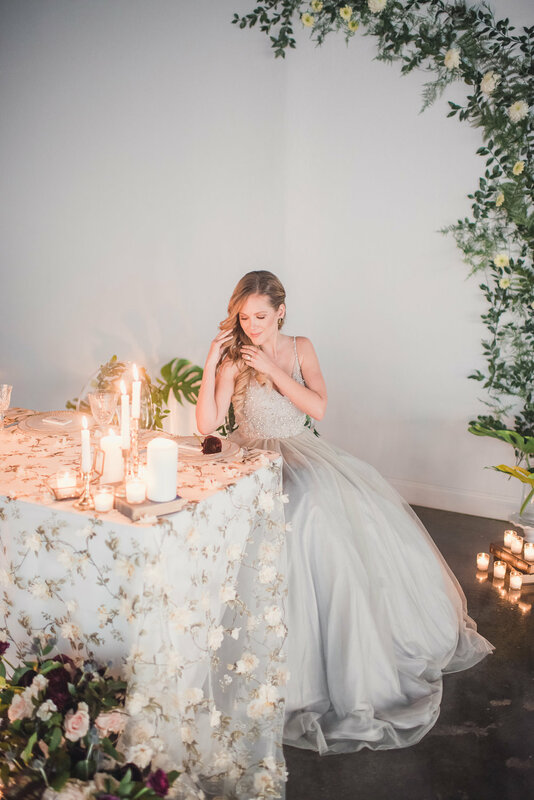 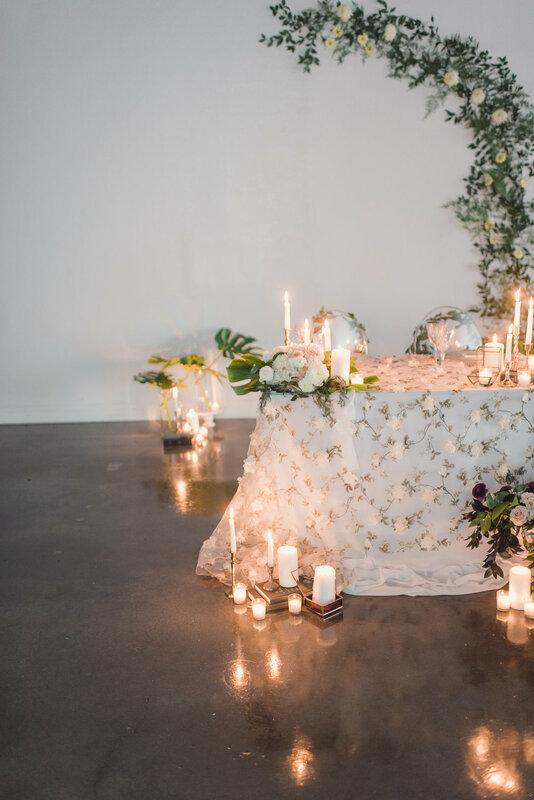 To make this mock wedding more intimate, we used a variety of different candles—pillar candles, taper candles on antique candle holders, and glass white votive candles, which illuminated the room. 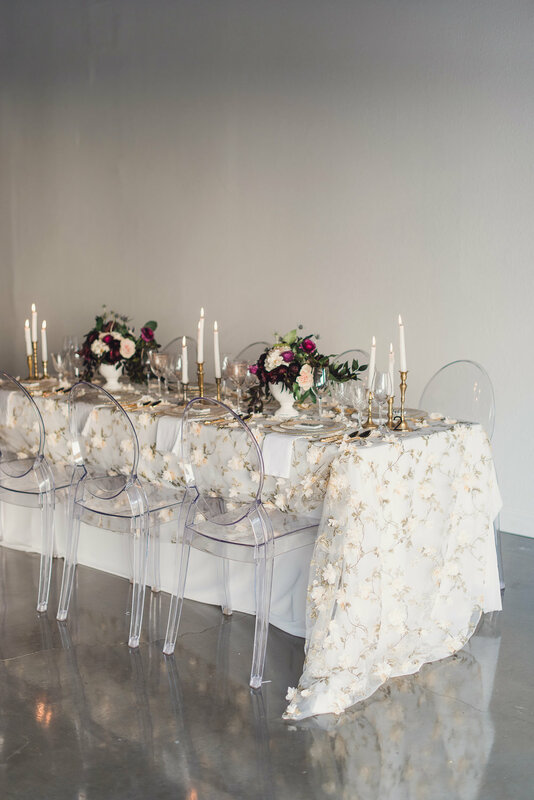 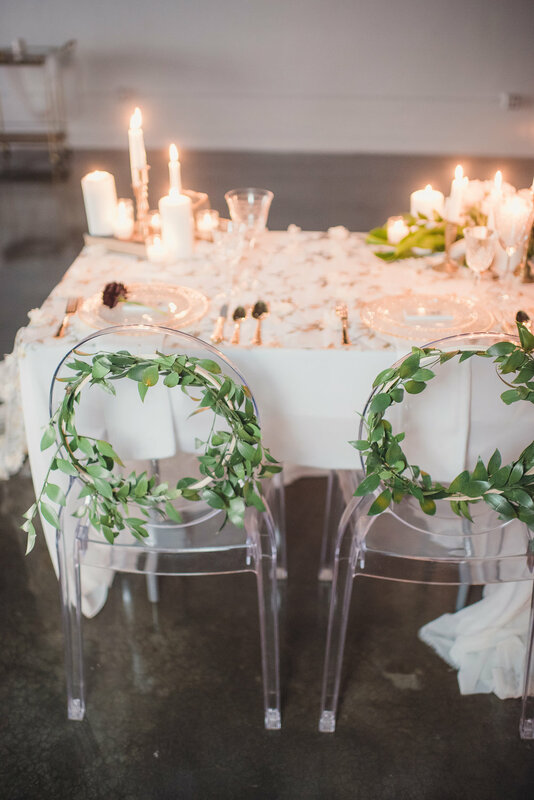 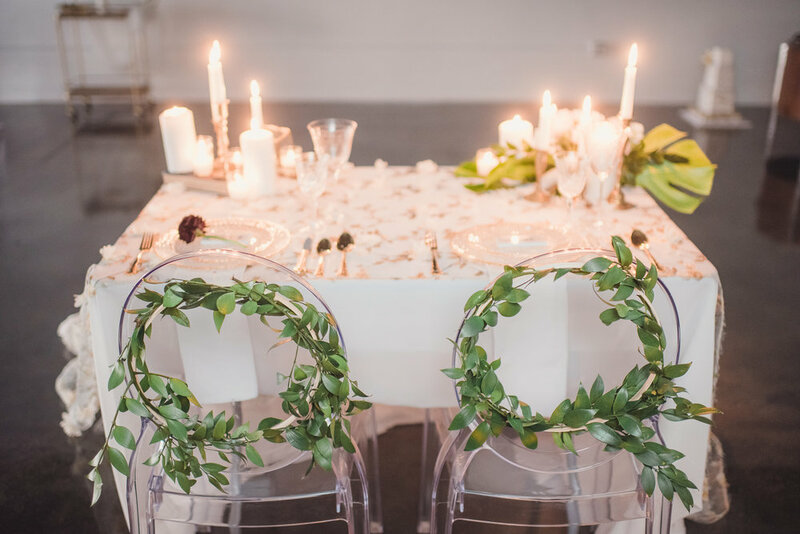 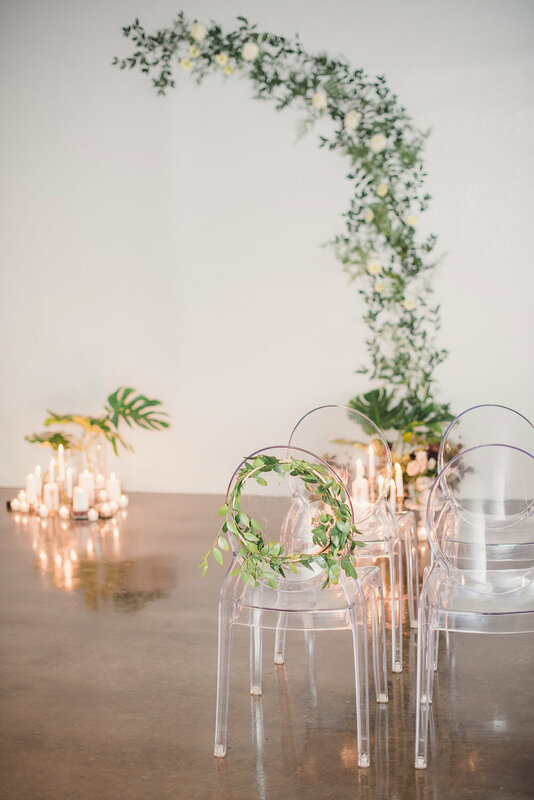 Unlike the traditional chiavari chairs, or garden folding chairs, we used ghost chairs to incorporate a touch of modern style for the shoot. 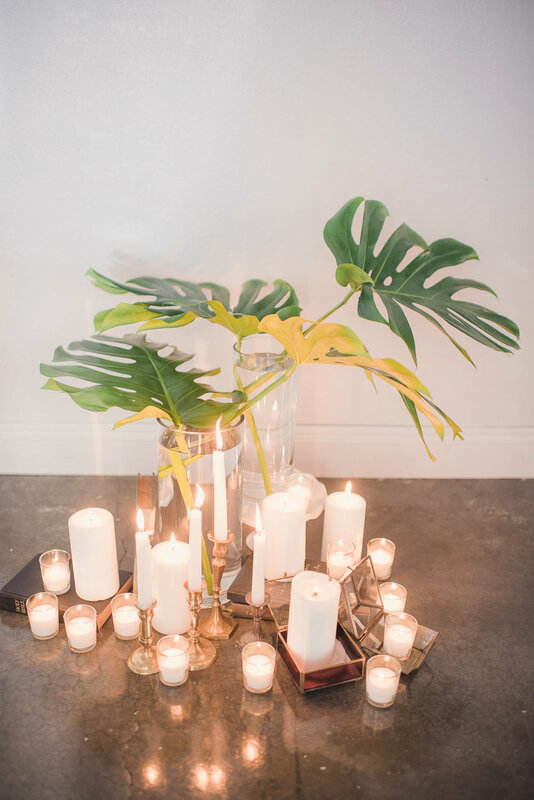 However, the use of vintage books, jewelry holders, and candle holders made it more timeless. 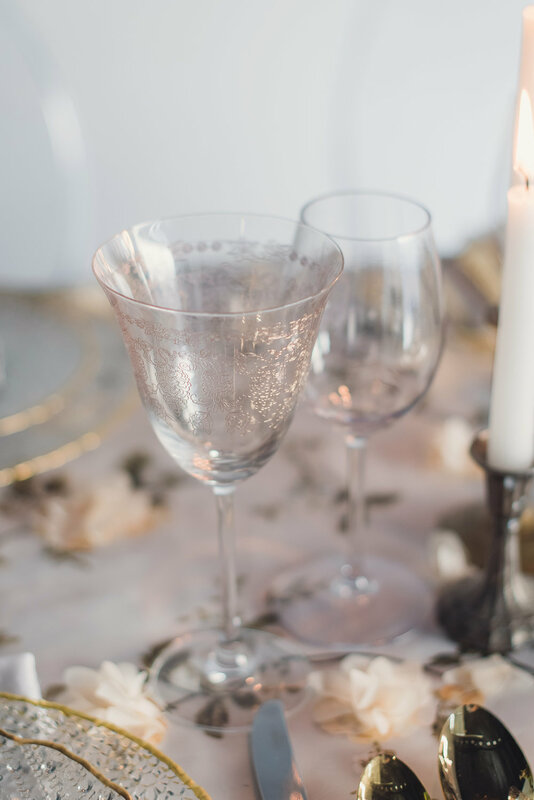 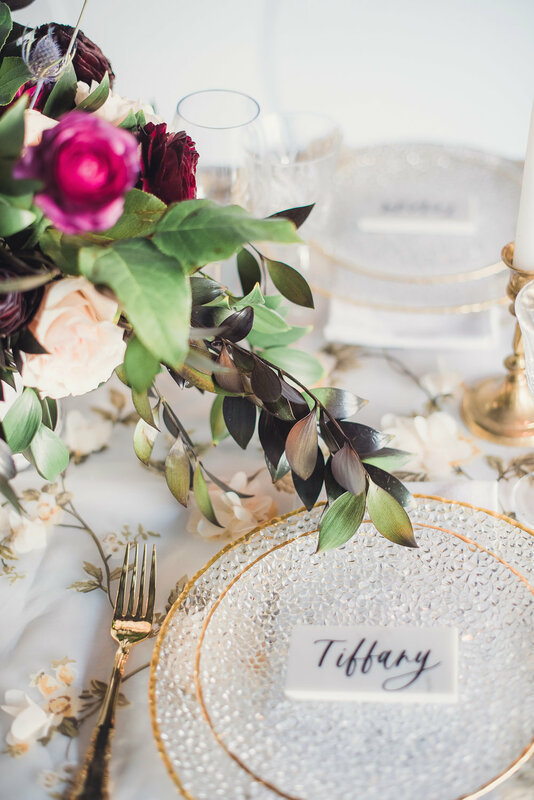 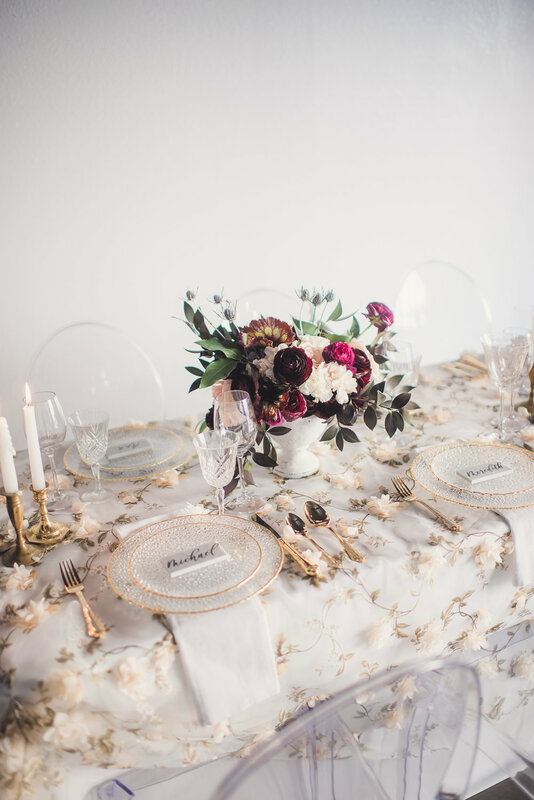 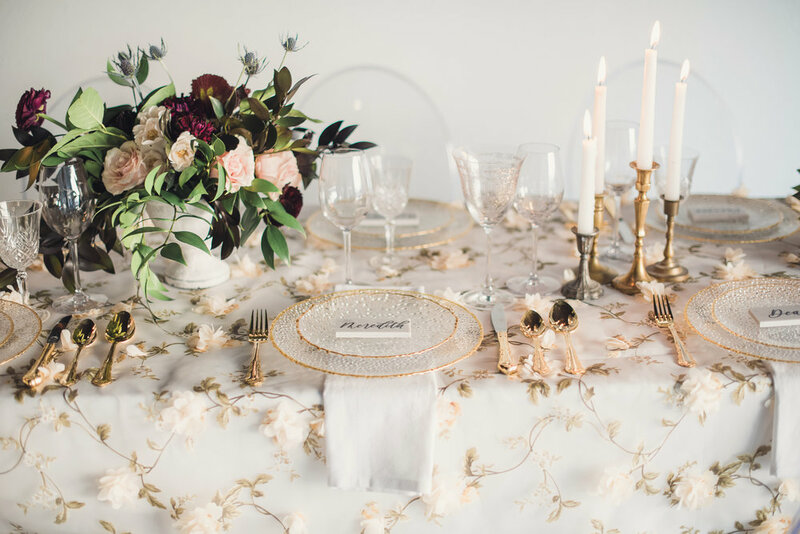 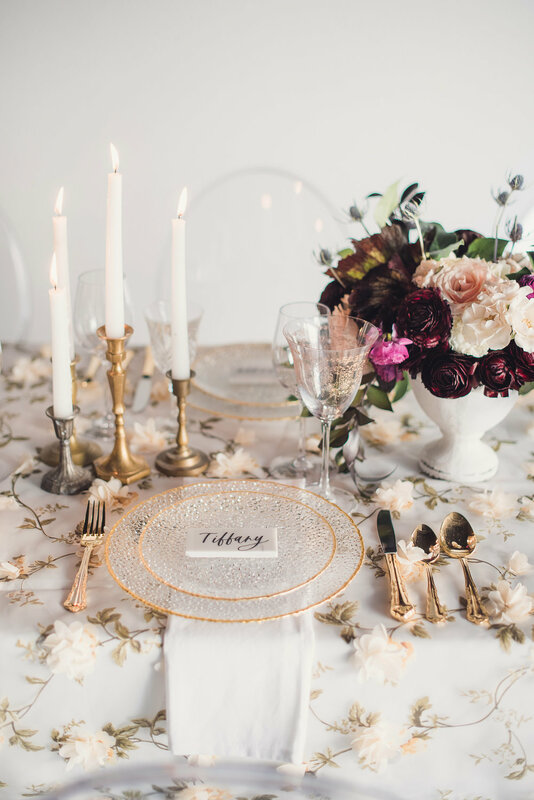 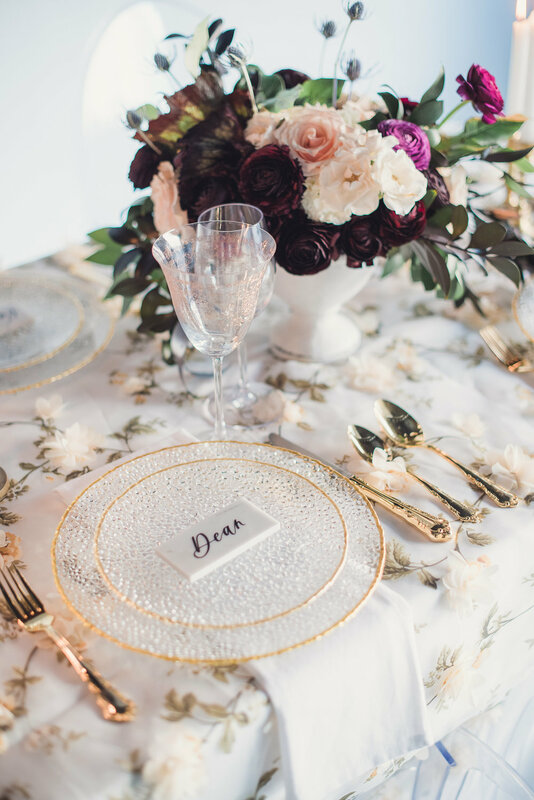 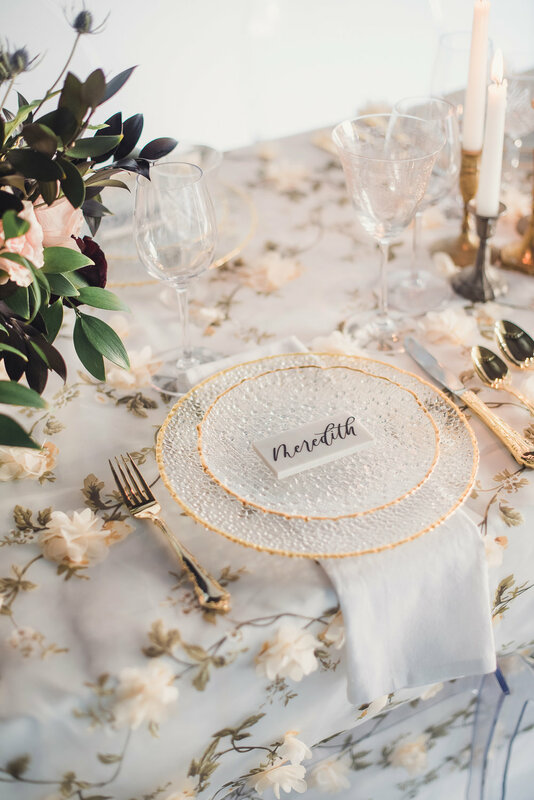 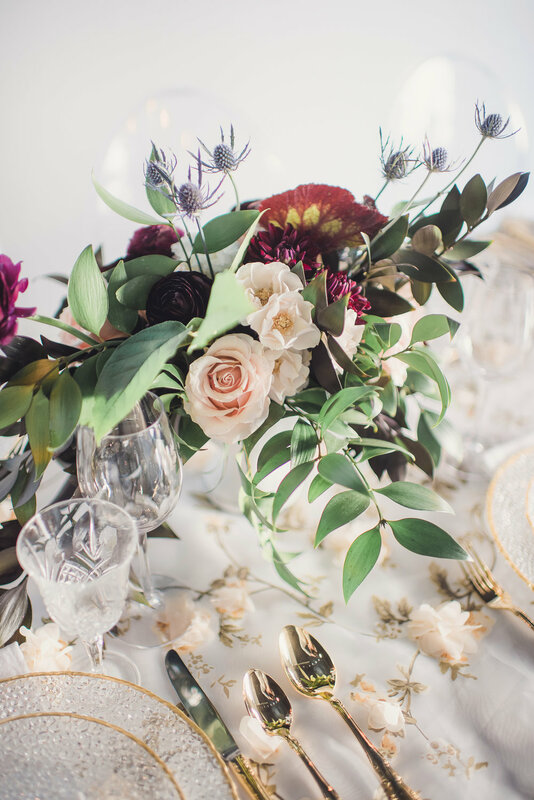 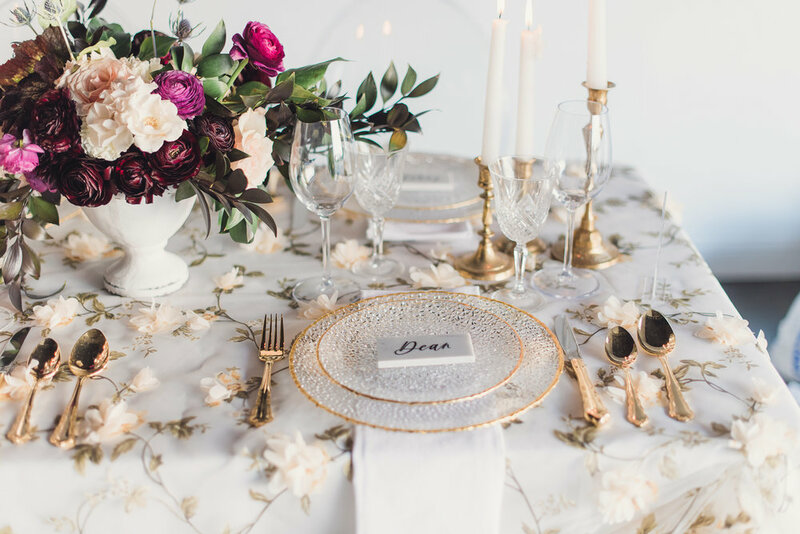 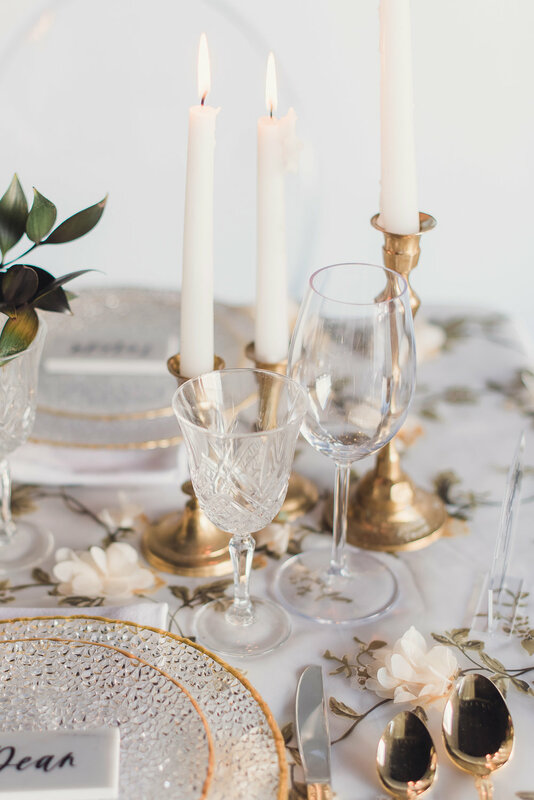 On our dinner table, layers of glass plates that had a gold trim and matching gold silverware sat on top of a gorgeous sheer floral linen that had 3D flowers. 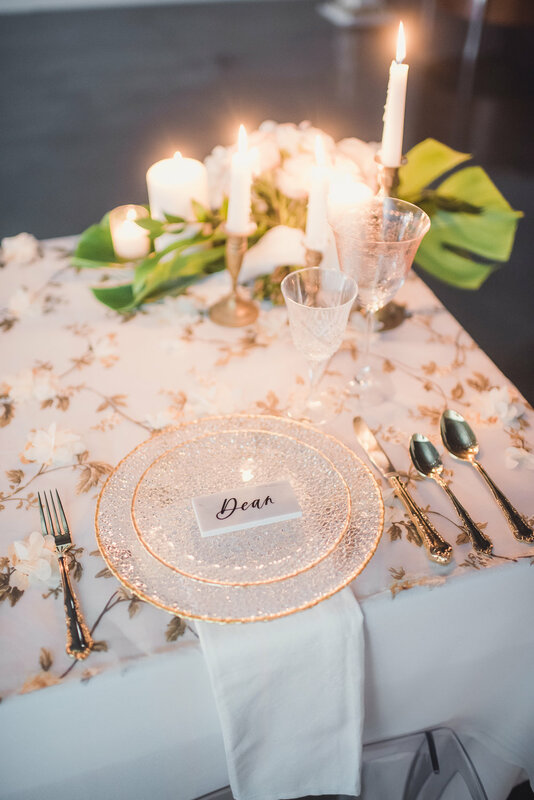 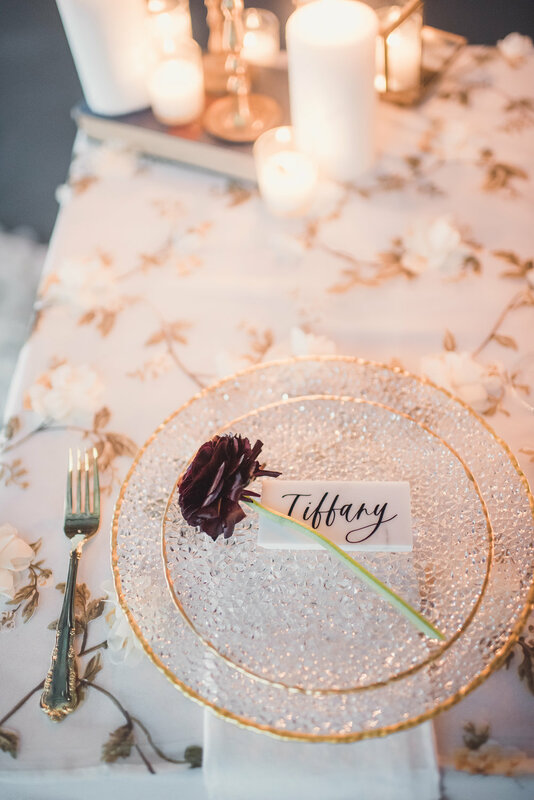 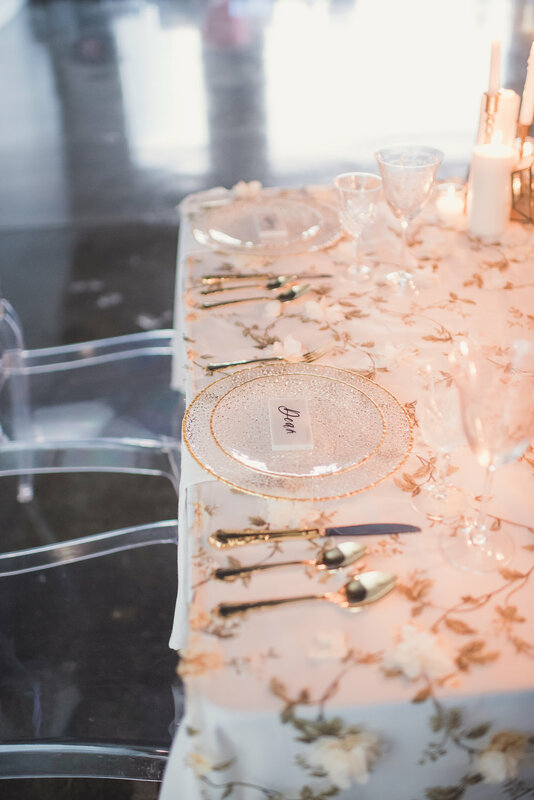 On top of each plate setting was a marble rectangular place card with the name of the guest written in calligraphy. 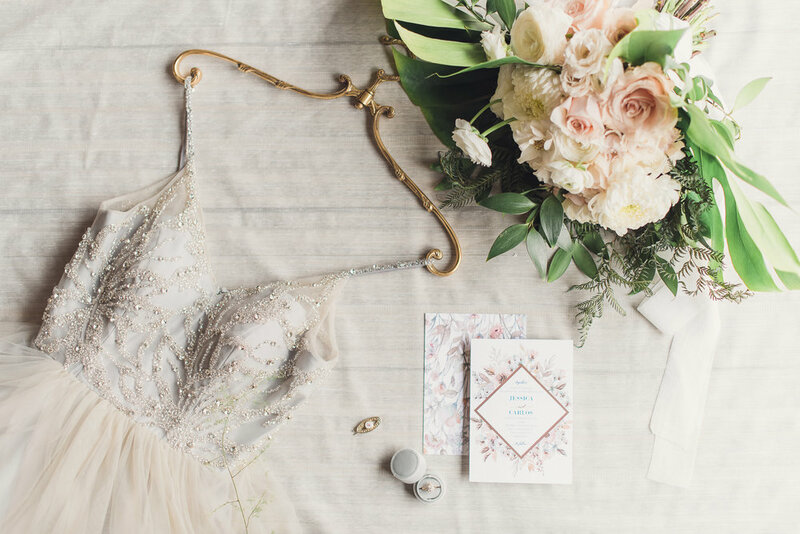 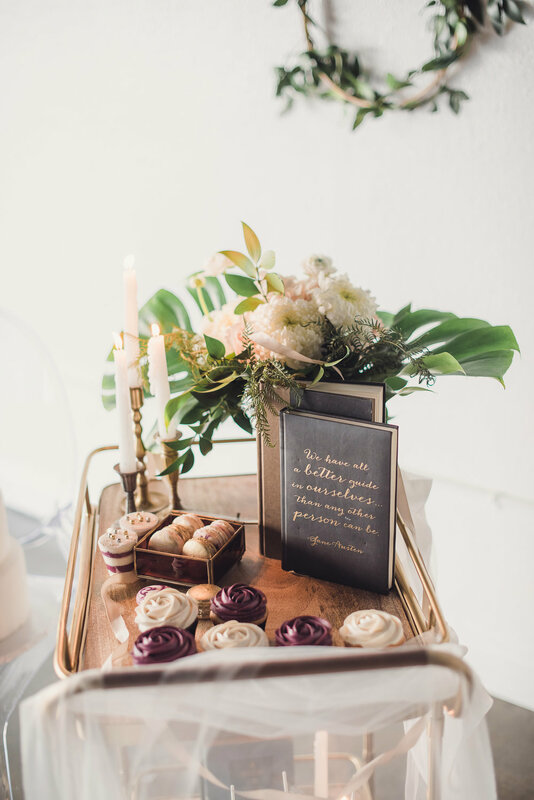 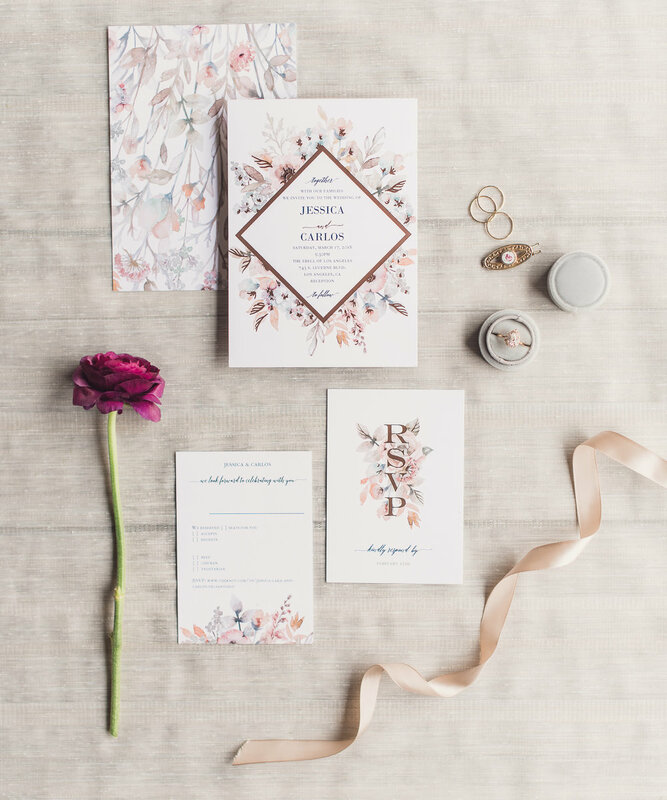 These pieces helped make our wedding very personable for our guests. 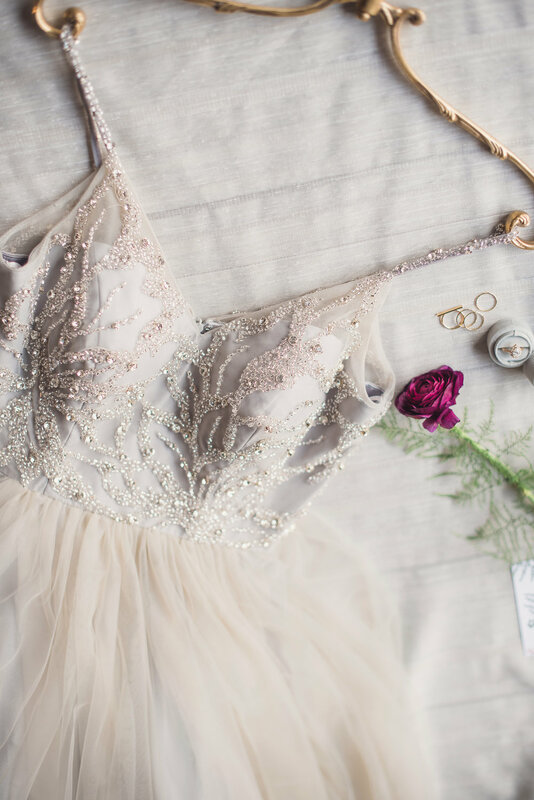 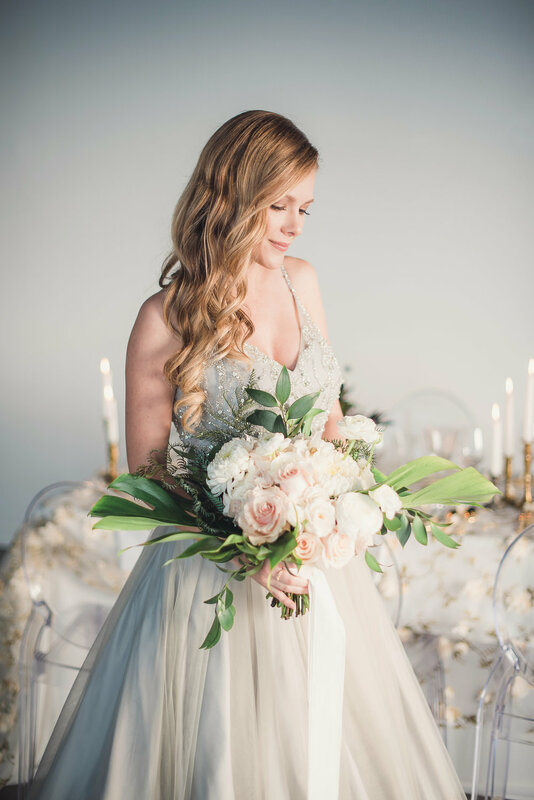 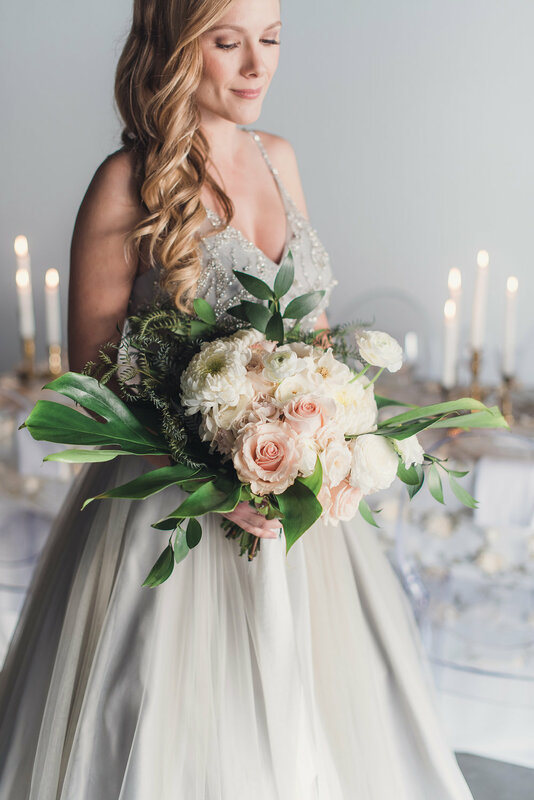 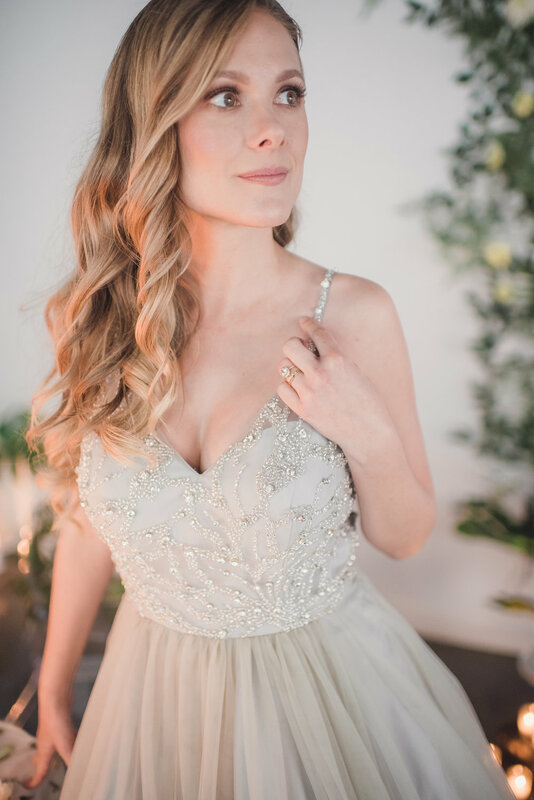 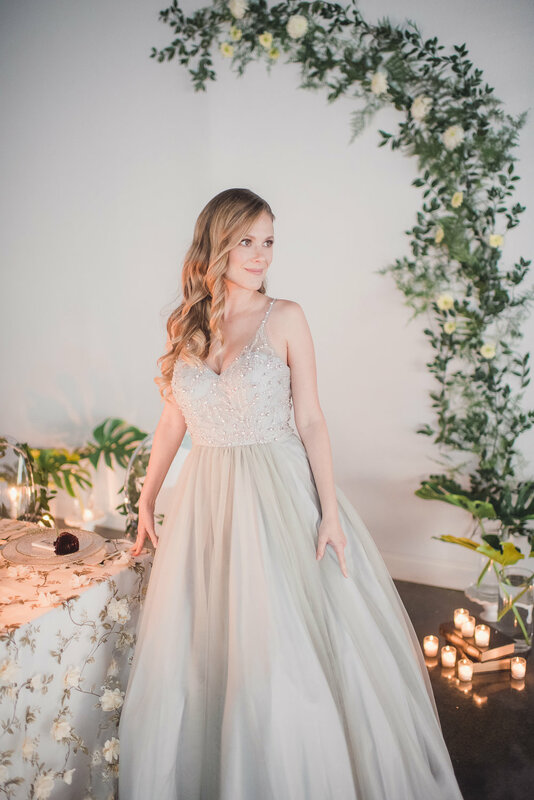 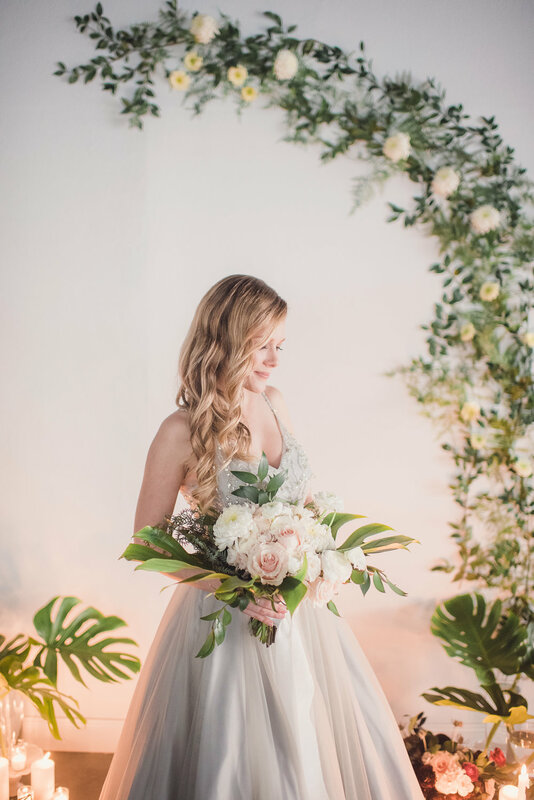 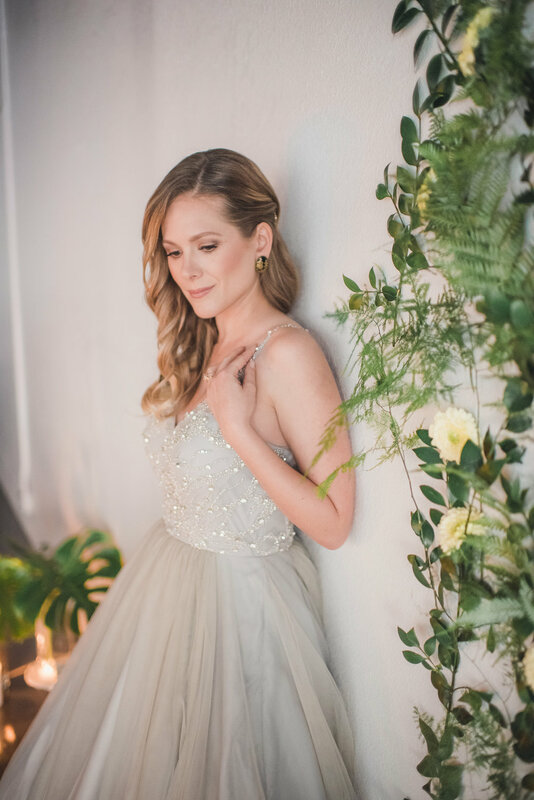 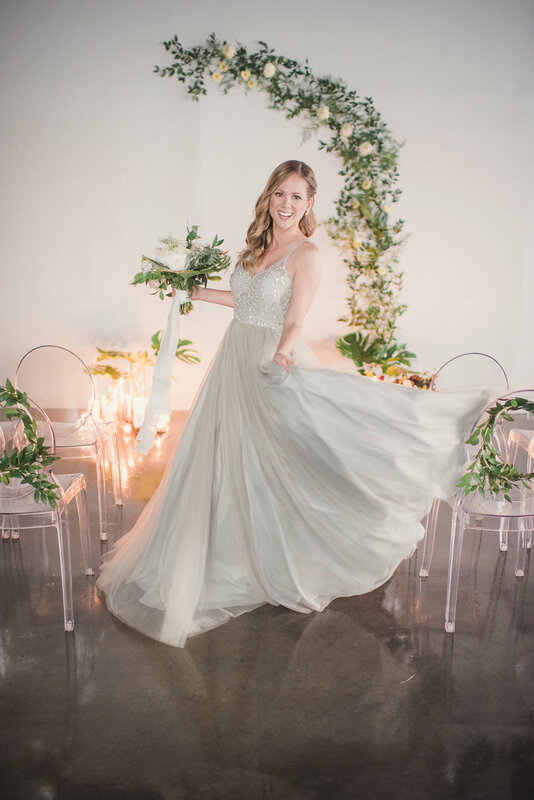 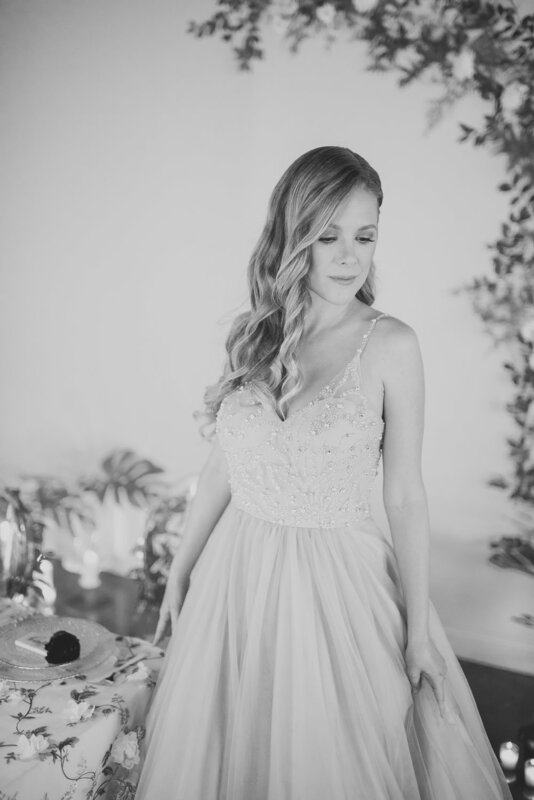 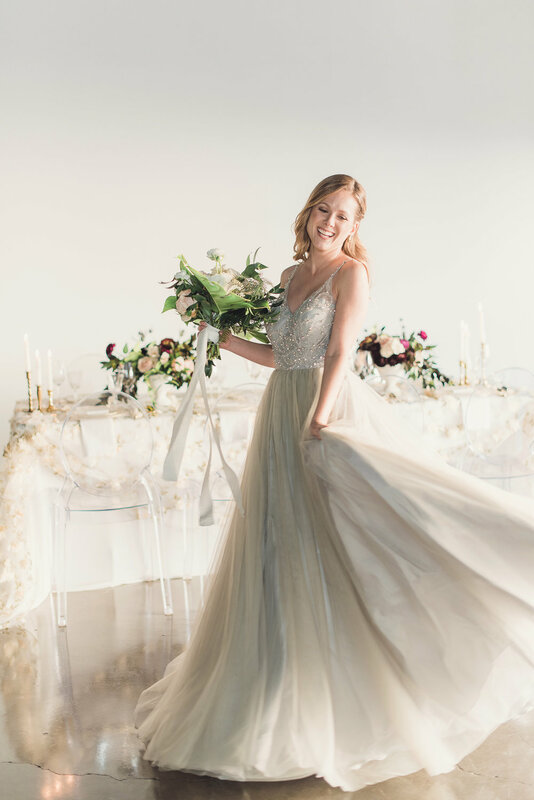 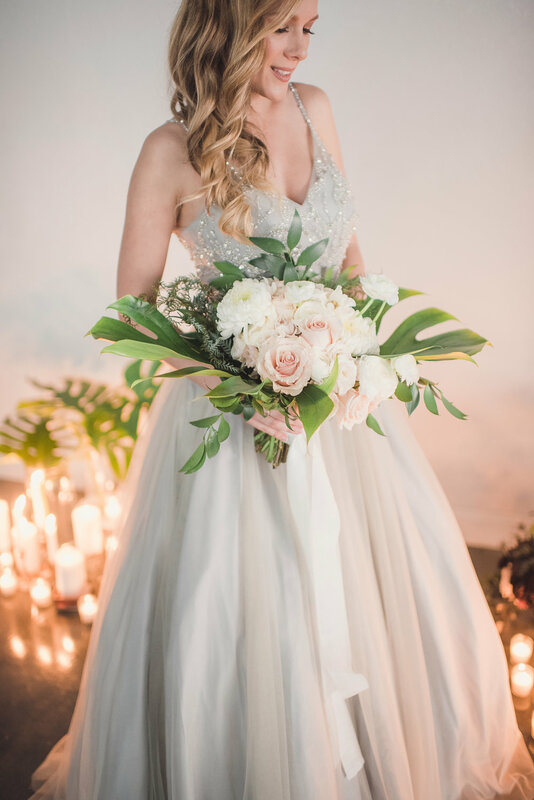 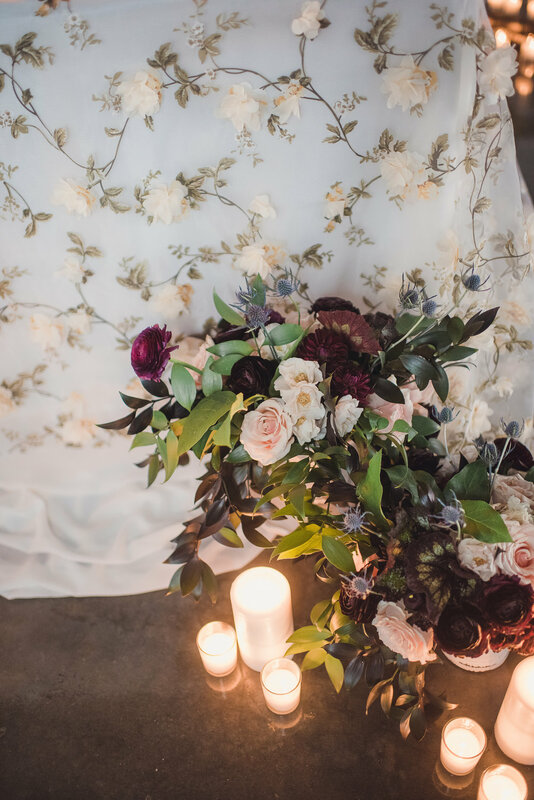 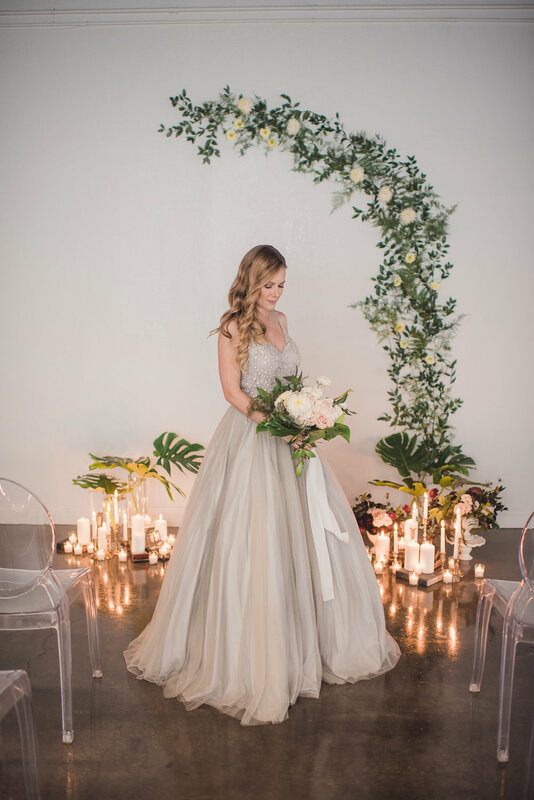 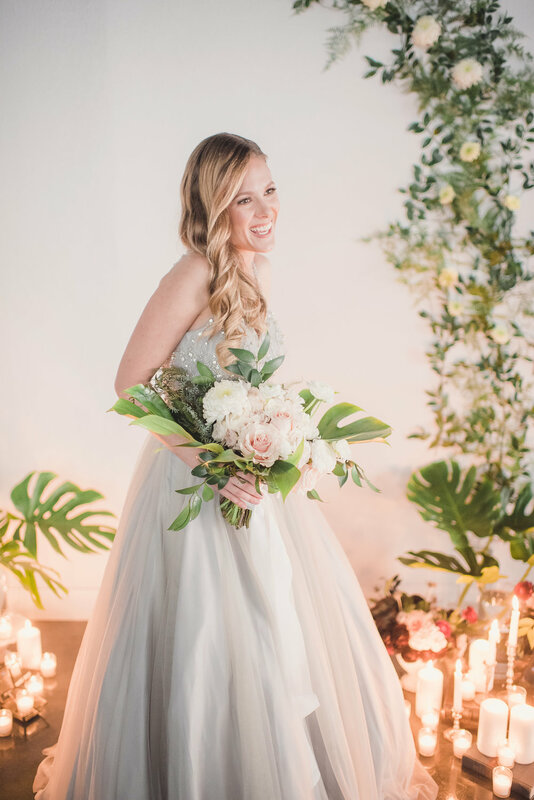 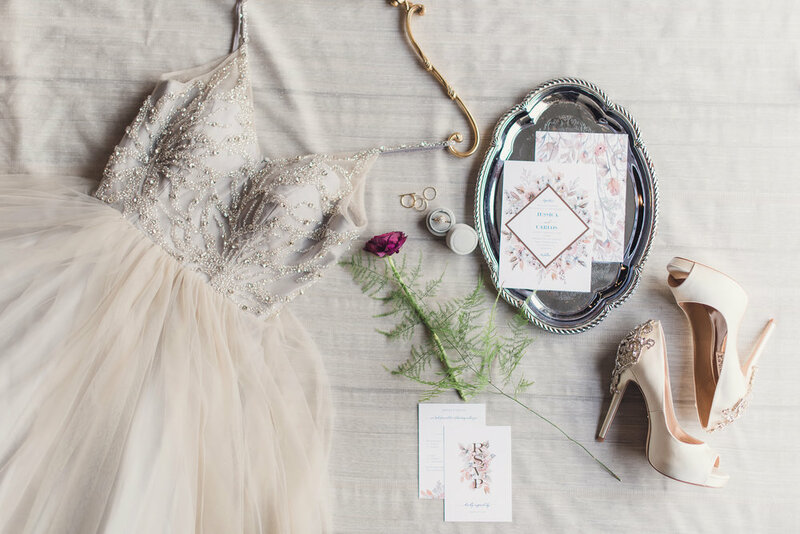 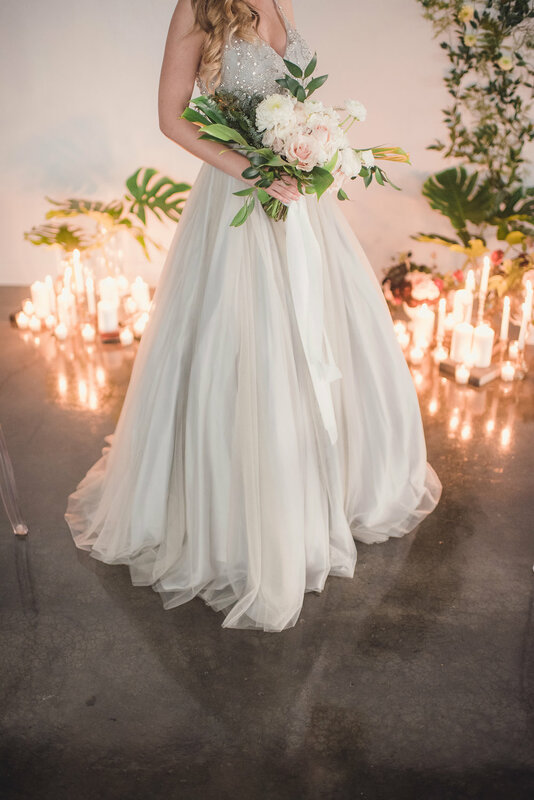 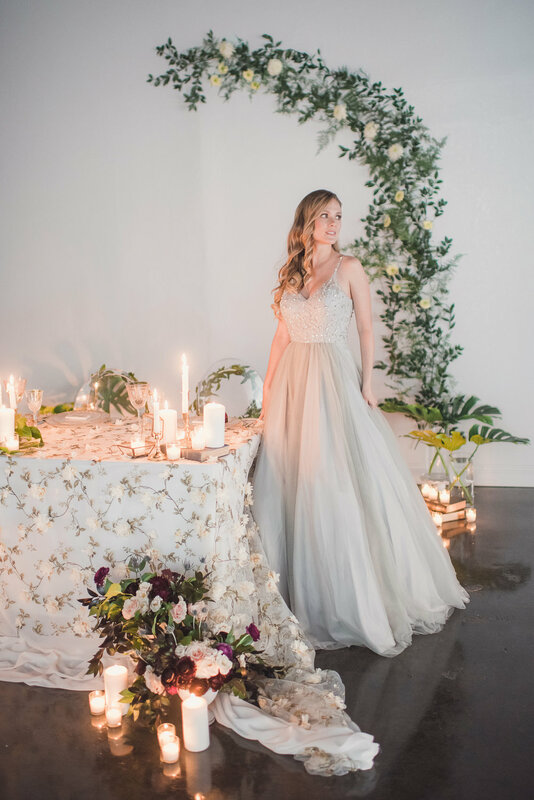 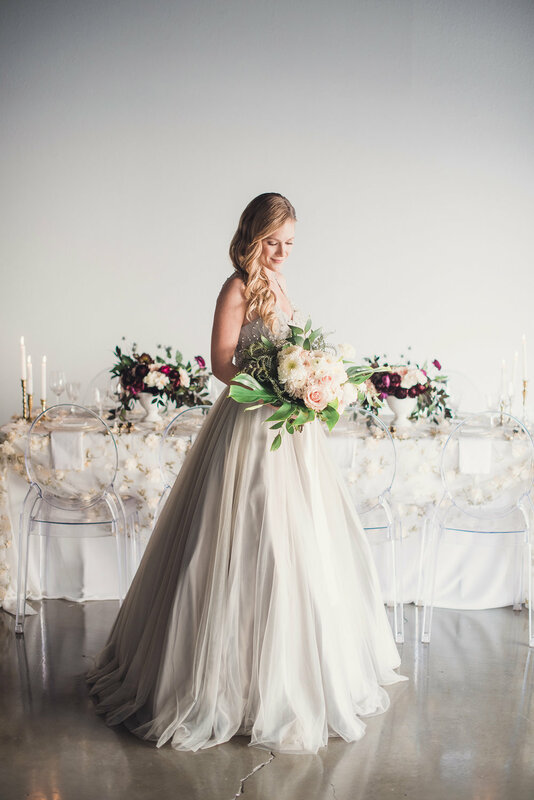 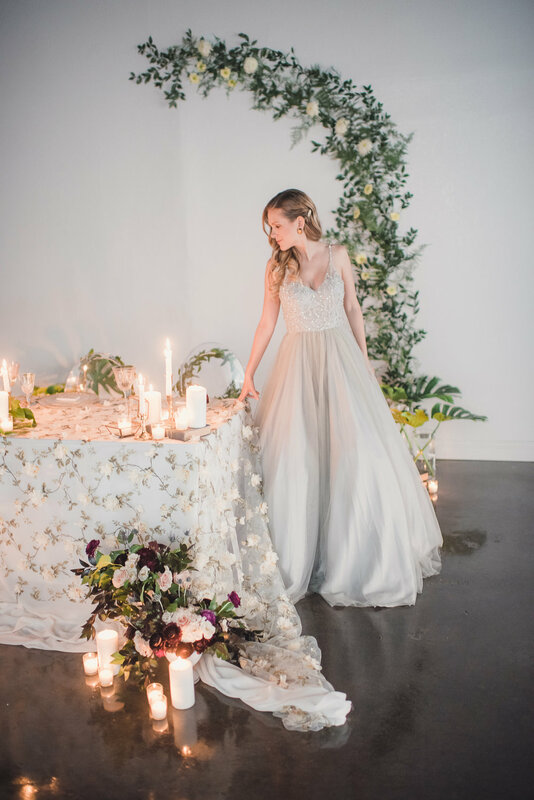 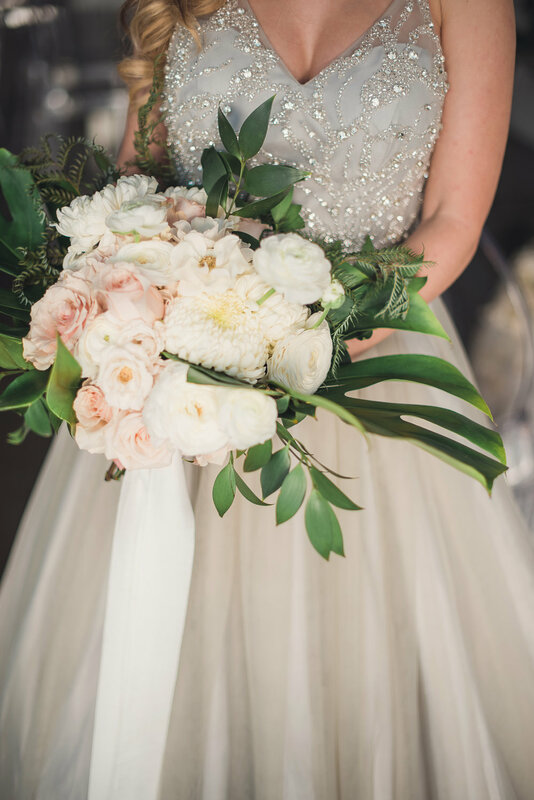 Swaying away from the traditional white wedding dress, our bride wore a breathtaking, gray A-line wedding dress that was beautifully beaded on top with chiffon flowing down. 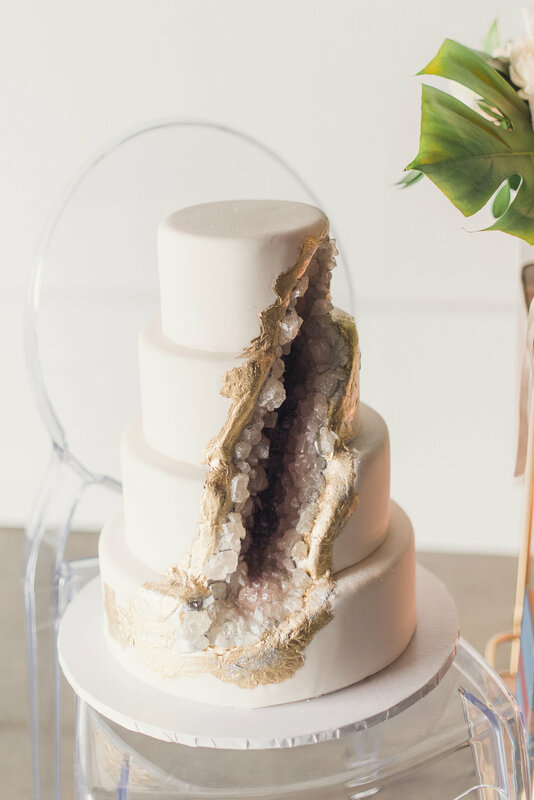 Our dessert table was not the typically table you would come across at a wedding. 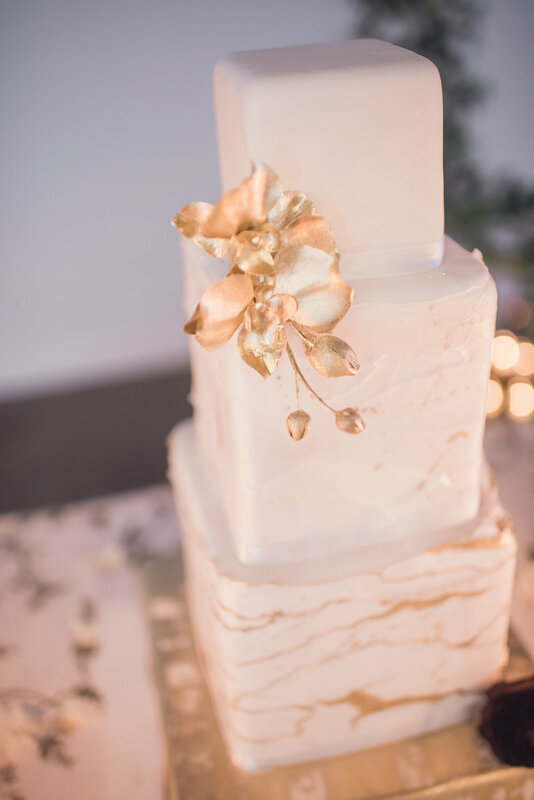 We displayed a 3-tiered wedding cake next to a dessert cart that was filled with different types of delicious treats. 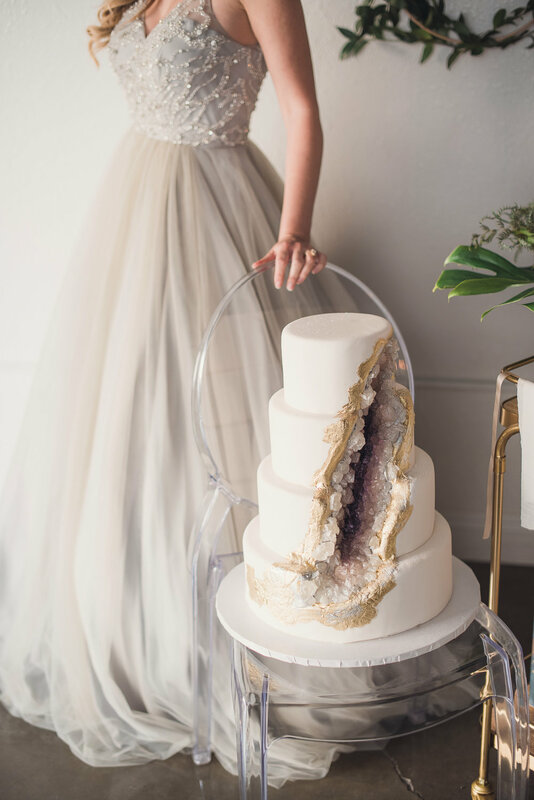 Desserts were displayed in no specific way. 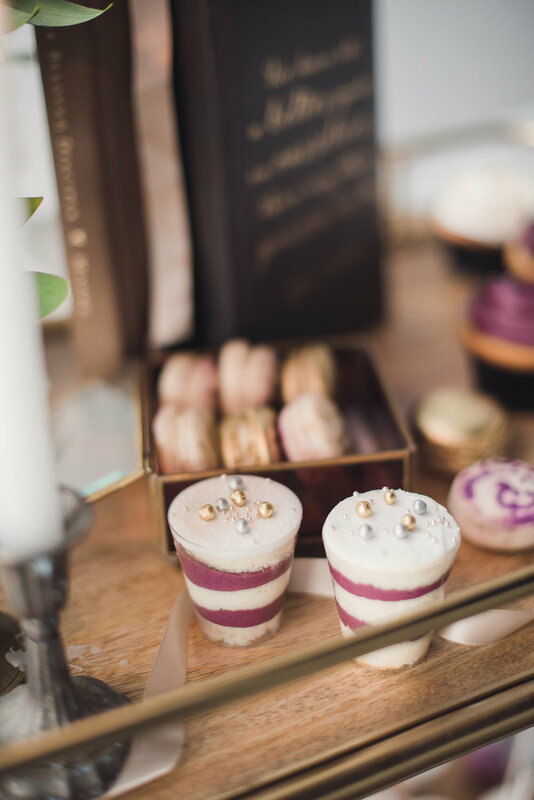 Some were on a gold cake stand, while others simply sat on top of the cart or in glass vintage boxes. 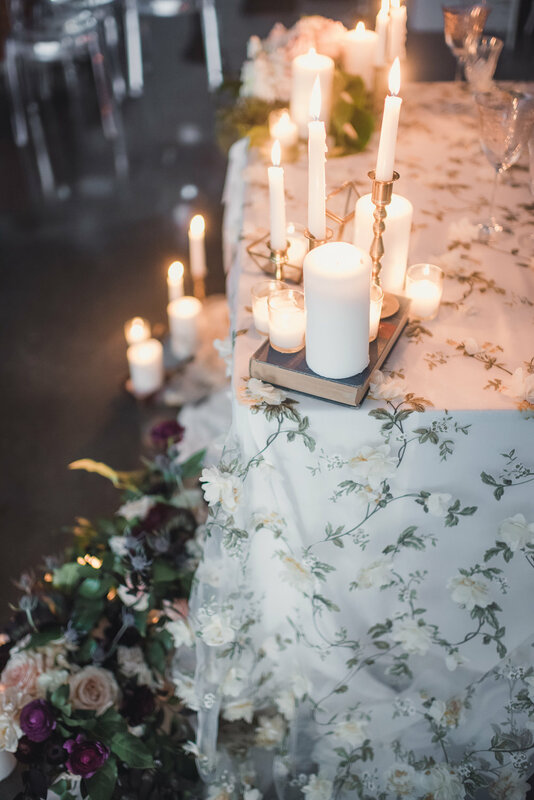 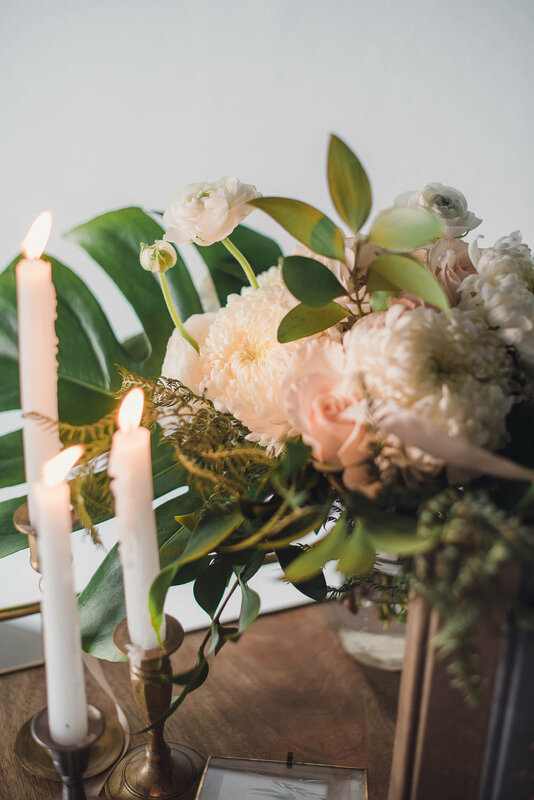 Vintage candles, and books were also used and displayed next to a flower arrangement, which gave a natural touch on the cart. 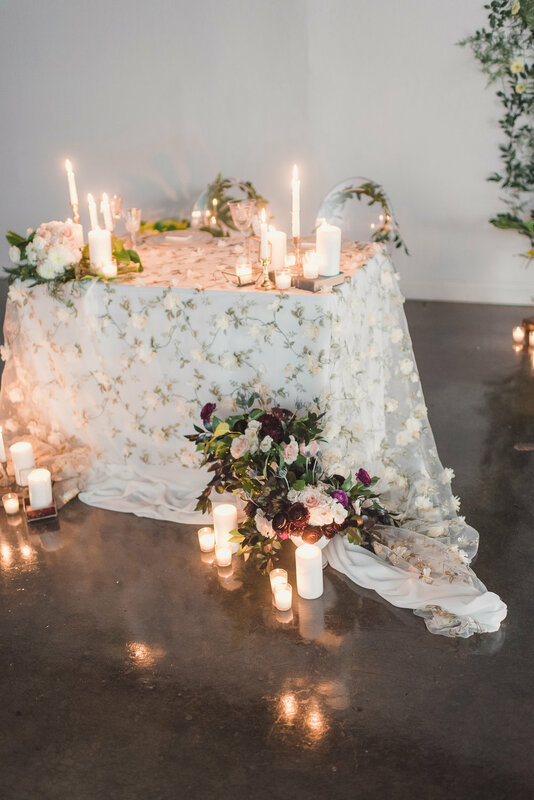 A long silky fabric was used to make all of the elements flow together. 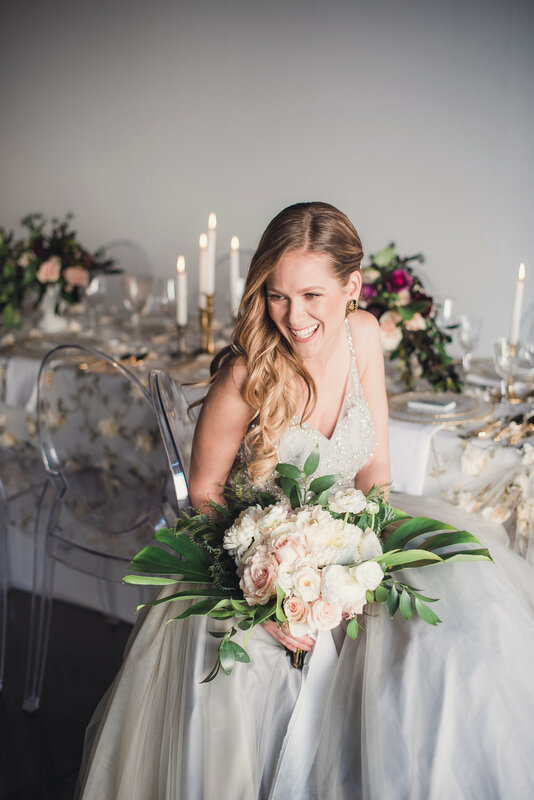 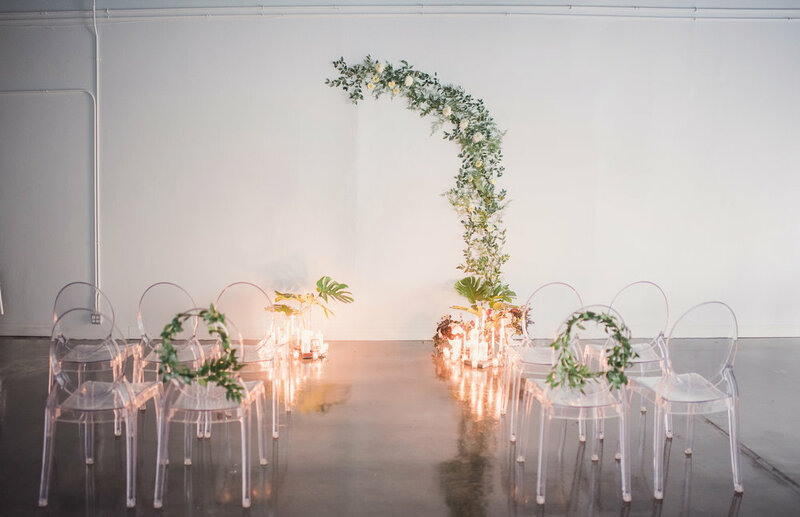 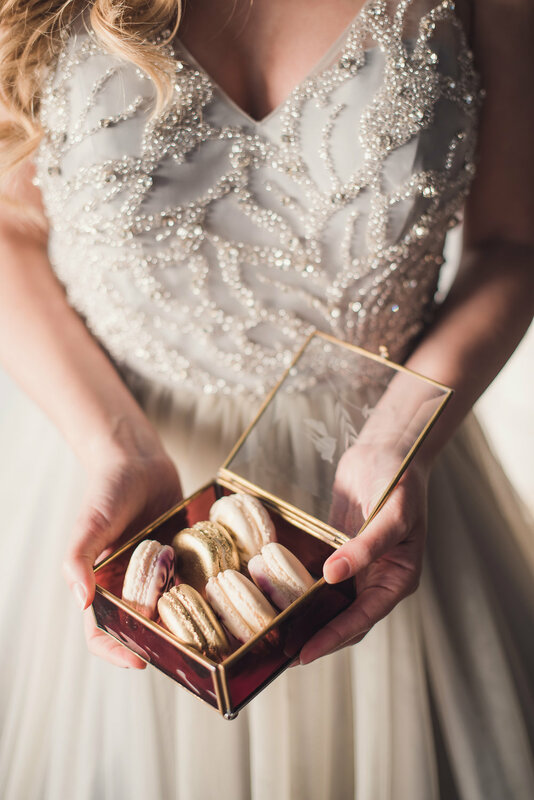 With wedding trends constantly changing, our industrial elegant wedding will continue to be timeless with elements that will never go out of style.